While most projections are predicting a Clinton victory, no statistical model accounts for what would happen if just one riled-up elk entered into the mix. Here are some ways it could change everything. 1. An elk throws up on Hillary. Serious concerns about Hillary’s health are so far just the stuff of conspiracy theories, but there’s still a very real possibility that if a single elk got itself all whipped up into a tizzy and threw up on her, and the vomit was mistaken for Hillary’s own, the entire tenor of this election could change in the frenzied heartbeat of an excited elk. 2. An elk crosses the Mexican border and causes a ruckus in a Texas hospital. One of Trump’s key campaign promises is increased border security. That means it would be bad news for Hillary if an elk were to get riled up in Mexico, cross into the U.S., and wander straight into a hospital’s nursery. That’s one scenario the Clinton campaign doesn’t want to be scrambling to recover from in November. 3. An elk eats all the early ballots. Every debate, press conference, and scandal would be effectively nullified if a totally keyed-up Elk kicked its way into where they keep the early ballots and ate them in a moment of delirium. Over 1.5 million Americans have already voted early, which is more than enough for a famished and jazzed-to-hell elk to swing the election one way or another. If that many Americans wind up being disenfranchised by a twitching, unpredictable elk, the election would become a complete toss-up. 4. An elk wrecks Gary Johnson’s head. Gary Johnson is polling as high as 8 percent, but that’s with a functioning head. Severe damage to Johnson’s head caused by an elk going absolutely nuts on him could very well have Johnson supporters shying away from the Libertarian and choosing another candidate, changing the election’s outlook completely. 5. Trump’s plane lands and no one exits it but an elk. This scenario would be completely impossible to recover from. News footage of a riled-up elk busting out of the door of Trump’s otherwise empty jet and tumbling down the stairs would cast serious doubt on Trump’s ability to keep the country secure. 6. An elk devastates Florida on Election Day. 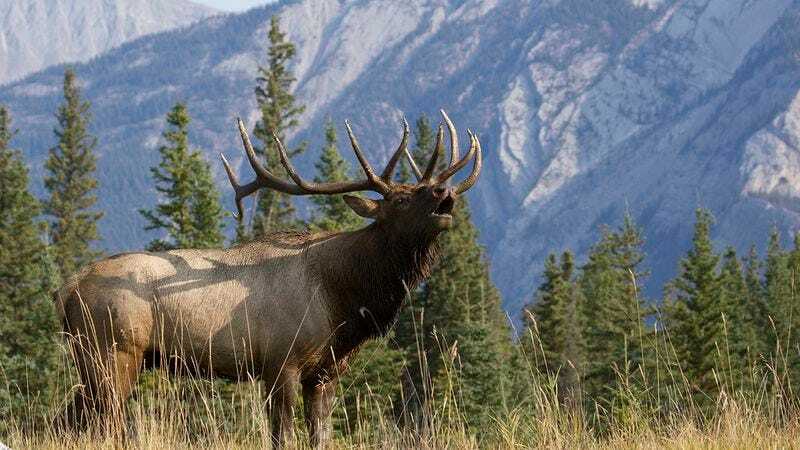 Bull elk weigh over 700 pounds, so you can imagine the chaos even a single elk could cause to Florida polling places if it were to get riled up enough. Unplugging voting machines, goring poll workers, grunting at elderly voters…An elk disrupting Florida on voting day could cause a huge swing in the election. 7. Footage emerges of Trump masterfully calming an elk down. Trump’s cocky and crass demeanor has earned him a record-low likability rating, but footage of him showing compassion to a riled-up elk by feeding it pecans and whispering, “You’re a beautiful elk,” to calm it down could humanize him enough amongst voters for him to take the lead in November. Hillary better pray that Trump doesn’t soothe a rambunctious elk until at least November 9th.